Here’s a unique ‘retro’ interior item - the Floppy Disk Table. 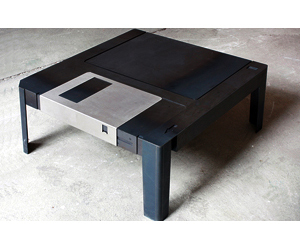 It’s just a coffee table, indeed, but it has a most original design, copying the old floppy disk to the last detail. The designer has recreated not just the shape of the floppy disk, but also added all its specific elements. It looks so real! Well, you cannot store data on this floppy, but its hidden storage compartment would come handy!